After you've completed your first Admin Training, your customer support specialist may have asked you to create any unique tasks that you'll need in your book. Seems reasonable. But, maybe it's been a few days since your training and you're busy and this is a lot more complicated than you remember. No worries, this article will break down the process of creating a task, and other articles explain how to fill out/understand each part of the task. Now, what you'll need to is select a business type for this task to be assigned to. For instance, if this task is installing a sink, you probably won't want it to show up in your HVAC book. After you've selected the proper book, click [Next] and you'll move on to your newly created task. There you have it. A blank task that you can build into anything you want to. I'll be linking the other articles that will help you understand everything else you'll need to know about tailoring this task to your needs. VERY IMPORTANT PLEASE READ: In addition to everything above, you must make sure you assign your task to a category after you create it or you won't be able to find it in your book. In addition to adding tasks from the task section, you can actually add tasks in right from the manage book section. Once you click that button, it will open a task creation screen in a new window. 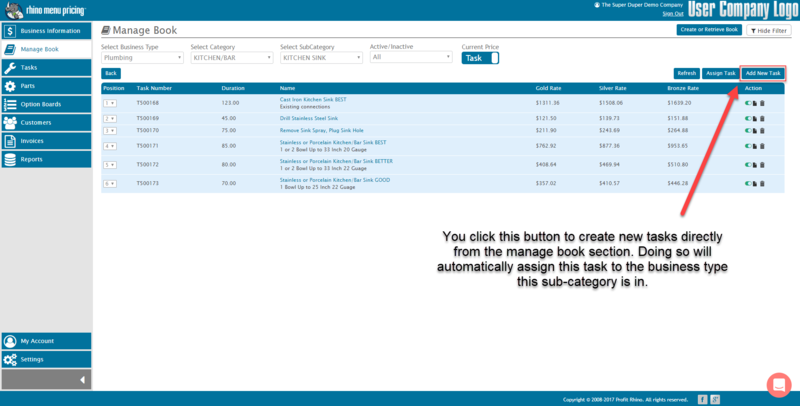 Once of the benefits of creating tasks directly in the manage book section, is that it will automatically assign the task you've created to the sub-category you created it in.